Nancy Gordon was an enthusiastic Licensed Clinical Social Worker when suddenly she was hit with a devastating illness that was not diagnosed for many years. And even when it had been diagnosed, there was no adequate medical treatment, so she knows firsthand what it is like to descend into the depths of disability. In today’s conversation you will learn of her inspiring Journey through devastation and disability to become a beacon of hope and healing. 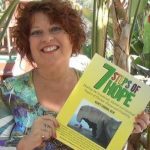 We will explore the seven steps of hope that she describes more fully in her guidebook, “7 STEPS OF HOPE Healing the Emotional, Mental and Spiritual Impact of Chronic Illness and Disability”.